Тhe Kanban card and the Kanban board are the two main components of Kanbanize. The Kanban card is a representation of a work item. It carries information about the task itself - who is responsible for the task (assignee); title and description of the task; how big the task is; what is the task priority, etc. Moving cards on the Kanban board users indicate their work progress through the workflow. When you create your first Kanban card, you are supposed to input task-related data in the corresponding card fields (gif.1). 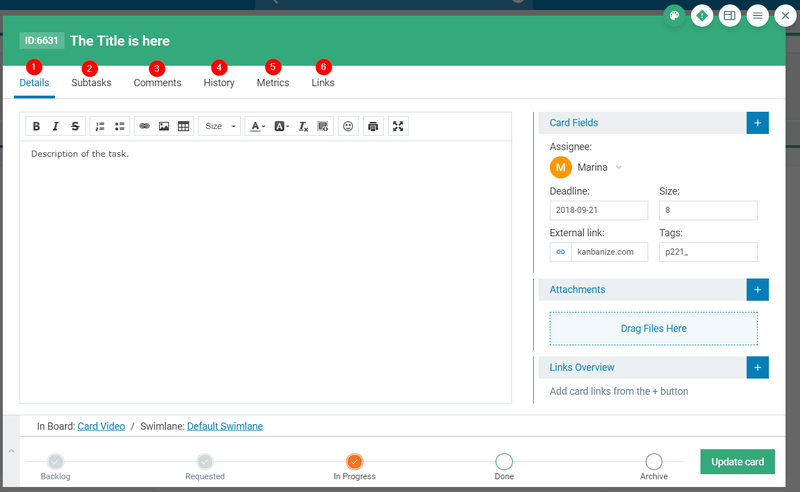 At least you can start with a card title and an assignee and click the ADD card button on the bottom right corner of the card to create it. The card "dissection" below shows the card structure and the location of all pertinent card properties and functionalities. (1) Card color: Using colors is an easy and quick way to make a card stand out and to categorize and group your work. (2) Card Priority: The priority indicates how urgent a task is. There are 4 stages of priority in Kanbanize: Low, Average, High and Critical indicated by different colors. (3)Template: you can design a card and set up predefined properties that will be constant for the cards for which that template is applied. This will cut the time it takes to set up all the properties every time when a new card is created. Just apply the template and the card will convert to the desired complex structure. (4) Card Settings - provides a shortcut to a lot of useful functionalities. Assignee: This is the user who is working on the task. Deadline: Select a date from the Calendar picker to set up a deadline for the task. Size: You can use different values to indicate how big a task is. External link: Enter a link to refer to an external source of information that is somehow connected to the task. Tags: Using tags allows you to organize your cards and search easily for a card later through filters. Card Type: Use card types to categorize your tasks by using predefined categories. Types are added at the project level and are customizable to meet your requirements. Watcher: Watching cards allows users to receive notifications for any changes that have been made on a certain card, even if you are not subscribed to get notifications from the board where the card is located. Custom fields that you have created for the board. The Custom Fields allow you to extend the properties (fields) of your Kanban card without limitations. You can also manage custom fields directly from your Board. 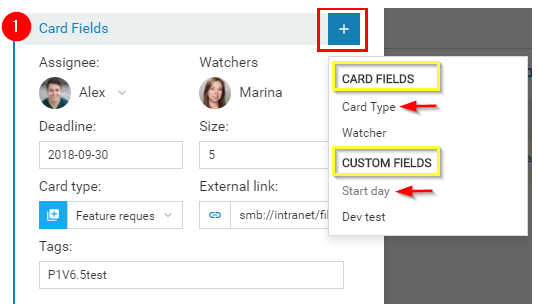 Important: Note that if you create custom fields to extend the card default properties, they will be made available in the additional panel (click the PLUS icon to open it). You have to select the Custom field to add it to the card. Then input its value. If the field is marked as mandatory, it will instantly appear on the card. Note: If no custom fields were added, the custom field-related data will not be displayed here. (2) The Attachments menu displays all files attached to the card. Use the plus icon (+) to upload a file from your computer; Dropbox; Box; Google Drive or OneDrive. (3) The Links Overview menu displays all card relations in the system and their type of links. Click on any of the links to open the related card. Use the plus icon (+) to link the current card with existing cards in the system and to instantly establish their type of relation. - At the bottom of each card, you will find the Position Control View that helps you to easily move the card to the next stage on the board (img.1). The Position control mirrors the workflow stages of the board where the selected card is currently located. All stages that cards have already passed through are colored in grey. Users can easily identify the current position of the card - it is marked with the icon matching the color of the stage. You can click on any of the stages ahead -> just update your card and it will be immediately moved to the desired position. Click on the ADD CARD button and the card will be created at your Kanban Board. The default closed card view of the card displays the information that you have filled in the fields prior to the card creation. Just click on any of the fields to modify the task information, without opening the card. 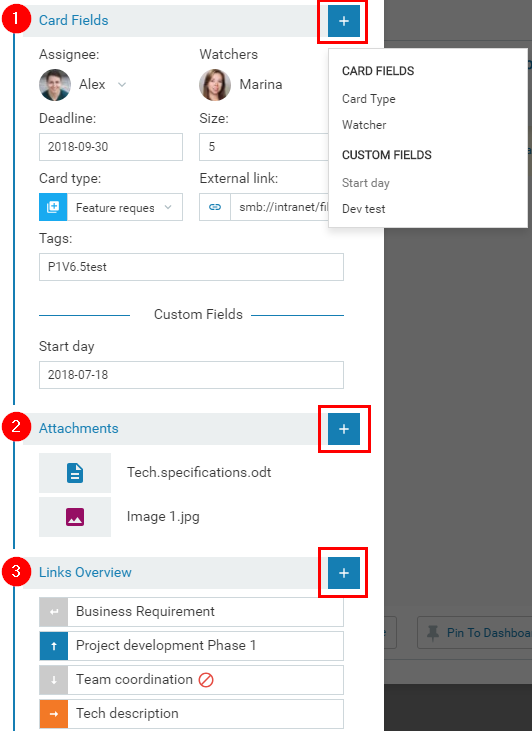 When you add the card -> it will be created on the Board and the following properties will be displayed by default: Card ID, Title, Assignee, Deadline, Priority, Tag, Subtasks, Attachments (on hover). Please, check Image 2, below. Card ID: Every card in Kanbanize has a unique card ID which is like the serial number of the card. The card ID is the easiest way to refer to a card in the system. It is displayed at the top left side of the card. Cycle Time of the card is outlined in red. It indicates the time a card has spent on the board. Kanbanize automatically records the time each card has spent along the process: from the initial phase until delivery. Context Menu - it provides a shortcut to many functionalities in the Software. This is the icon at the top right corner of the card. Subtasks - are small action items which are part of a bigger task; like a checklist that needs to be completed in order for the task to be completed. In case that you want to display more task details at the closed card view, then you have to configure the Card settings. To achieve that -> click on the Grid menu at the top right side of your board interface and select Configure Card View. There you can switch on and off the card properties that you want to display or hide. Note: Only the card ID, the Assignee and the Title of the card cannot be switched off. The image below visualizes how the card looks when all available card properties are displayed. You can access the respective fields with a single click. 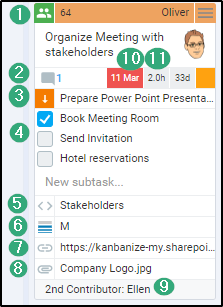 The Kanban card has six main tabs that appear once the card is being created. Open the card and review the tabs as follows: Details, Subtasks, Comments, History, Metrics and Links. (1) Details: In this tab, you can provide a description of the task in the dedicated field. A rich- text format is available. The Details tab gives you an access to all card properties and to the Position Control view of the card. 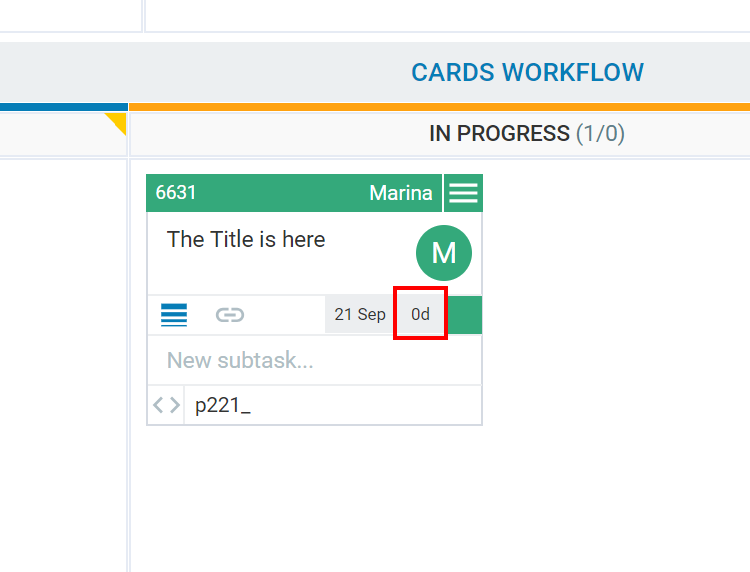 (2) Subtasks: In the second tab of the card you can create and visualize the subtasks of the card. The subtask is an element of completing a larger and more complex task. It has two statuses: checked and non-checked. Checkmark a subtask to mark it as completed. You can assign subtasks to different users in the account. Via the Options icon, you can edit or delete a subtask or convert it to a regular card. (3) Comments: In this tab, you can add comments relevant to the task. In case that you have set up an email integration, you can even send and receive emails from/in the Comments tab. If you mention users in the comment section via the "@" symbol, they will receive an email or system notifications that will re-direct them to the card. (4) History: In this tab, you can view the history log of the card - all activities or card changes that happened. The following information is provided: event name, author, details, date. (5) Metrics: In the Metrics tab you can get an overview of the lead time and the logged time for the card. For more detials, plese check p.4 of the dedicated article. (6) Links: This tab gives you complete control of the links of each card that you open. You can create new links, monitor the status of existing ones in a Kanban Board/Table/Graph view, and even create new links to related cards. Read more about the Kanban card.